Apple’s “fastest Mac ever” is now available to order from the Apple online store, with prices starting at $2,999. The high-end desktop, which is assembled in the United States in Austin, Texas, is currently shipping before the end of the year. You can also pick one up today from your local Apple retail store, or from an Apple authorized reseller. 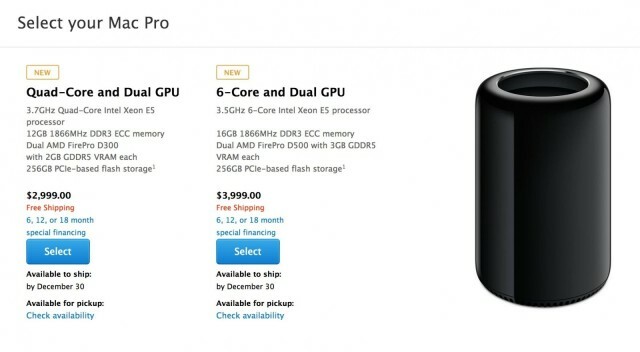 The new Mac Pro sports an all-new design for the first time since 2008, and it measures just 9.9 inches tall. But inside that tiny package, you’ll find Intel Xeon E5 processors, dual “workstation-class” AMD FirePro GPUs, up to 64GB of ECC DDR3 RAM, and up to 1TB of solid-state storage. The base model, which is priced at $2,999, packs a 3.7GHz quad-core Xeon E5 processor, 12GB of RAM, dual FirePro D300 GPUs with 2GB of VRAM each, and a 256GB solid-state drive. The $3,999 model comes with a 3.5GHz six-core Xeon E5 processor, 16GB of RAM, dual FirePro D500 GPUs with 3GB of VRAM each, and 256GB of solid-state storage. You can also custom build your own Mac Pro to add 8-core and 12-core Xeon E5 processors, and FirePro D700 GPUs with 6GB of VRAM. Interestingly, you can also buy your Mac Pro with a 4K Sharp monitor — the one that briefly appeared on the Apple online store last week — for an extra $3,595. Any customizations you make will delay your order, however, with custom-built Mac Pros expected to ship in January.